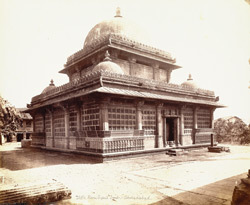 Photograph of Rani Sipri's Tomb at Ahmadabad in Gujarat, taken by Henry Cousens in the 1880s, from the Archaeological Survey of India. This tomb lies to the north-east of the mosque. It comprises a square of twenty columns enclosing another of twelve. A perforated screen, resting on a low wall between the outer pillars, encloses the entire tomb. Around the corners of the building is a carved stone rail, up to the height of the pillar bases, with a cornice that curves outwards.